W L Wyllie (1851-1931). Pencil drawing. Undated. Provenance: with Chris Beetles Ltd, London. The provenance of the drawing (it comes from the highly respected and well known specialist dealer in W L Wyllie's works, Chris Beetles Ltd of St James's London) is on a label on the reverse which explains that the drawing was shown at Wyllie's L'Entente Cordiale exhibition, 2nd June- 1st July 1988 as exhibit no.178. Beetles believe the battle cruiser in the foreground to be HMS NEW ZEALAND (Captain J F E Green) and everything in the draftsmanship would endorse this. Bearing in mind that WLW's accuracy of detail is one of his most recognised and admired attributes, its safe to say that this is a ship of the Indefatigable class of which there were three, INDEFATIGABLE, AUSTRALIA and NEW ZEALAND. 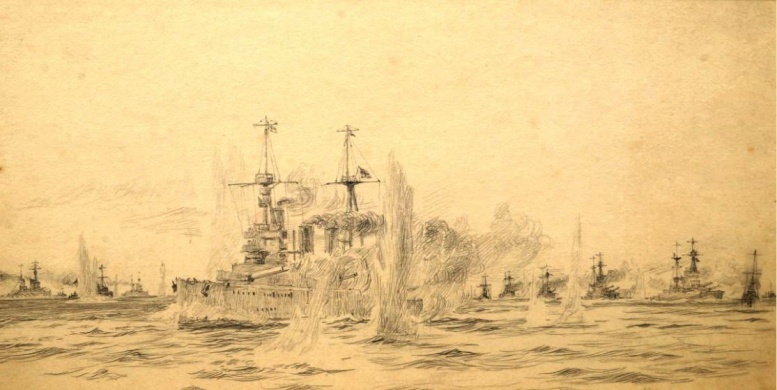 And so although this pencil drawing is undated it is believed to have been executed soon after the Battle of Jutland on 31st May/1st June 1916 and before ship dispositions had become clear. Wyllie was not at sea in any of the participating ships and so he like other marine artists of the day had to rely on first hand descriptions and photographs of the various actions that made up the battle as a whole once ships had returned to harbour and had time to spare give to visiting artists of which Wyllie, we know, was one. Time was also an issue, of course, with the artists themselves who would have been keen to be in a position to 'beat the competition' and have their paintings out there before others had completed theirs. More on this later. But this was wartime and there were rules about what could and could not be allowed to be released into the public domain. Wyllie was in a rather special position in that he was offically accredited to the Admiralty as a naval war artist. In practice this appeared to mean that any painting (oil or watercolour) or etching executed either as a commission for the Admiralty or individual had to be passed by the censor to ensure that the subject or its details was not in any way likely to compromise security of the British fleet. There are many examples of such paintings which carry on the back the censor's official stamp and comments about its suitability or otherwise for a wider audience - and a watercolour by Wyllie of light cruisers preparing to sail with despatch appears on this very website is a typical example ("Light Cruisers 1916"). Its therefore for consideration that this drawing was only ever intended as a preliminary for a much larger painting (probably an oil, bearing in mind that the drawing is not of immodest size!) so did not need to go near the censor. POST SCRIPT 23 April 2017. The original which was was based on this drawing has indeed now been traced - appropriately its in the National Museum of the Royal New Zealand Navy, Torpedo Bay, Auckland, New Zealand. It is entitled "HMS NEW ZEALAND, the Sixteen Point Turn at Jutland 31st May 1916" and portrays the stage in the battle at about 1640 on 31st May when Beatty, realising that he is about to run into the full might of the enemy's battle fleet, has ordered his ships to turn away to starboard and reverse course in what became known as The Run to the North as Beatty leads the unsuspecting Germans up towards the full might of Jellicoe's battle fleet. We can indeed see that NEW ZEALAND has starboard wheel on as does the destroyer out on her port quarter who is turning tightly to starboard as she attempts to stay in her screening station. POST POST SCRIPT (28 April 2017). I am informed by a Trustee of the RNZN Museum that the "original canvas" in the museum in Auckland is, sadly, not the original - it is a copy of the original. But now we do at least know that there is indeed 'an original' and although its whereabouts remains unknown we have moved two stages further along the story as the print in the RNZN's museum is clearly a copy of that elusive original painting with only a few differences being apparent (a shell splash or two has moved, smoke from one or two funnels has been altered): it's in colour and looks virtually identical to the drawing. And the painting now has a title too ("The Sixteen Point Turn at Jutland...") which could help to track it down. And knowing now that we are looking at the stage of the sixteen point turn ("at 1638, course was altered 16 points to North" as tersely reported by Captain Chatfield of LION in his Captain's Report of 4 June 1916) then all ship dispositions drawn here by Wyllie do make sense. The ships over to the left (to starboard of NEW ZEALAND) are Beatty's battle cruisers that have already settled on their northerly course; NEW ZEALAND, now the last in line as INDEFATIGABLE, astern of her, had been lost some half an hour previously, has her helm over as she starts to come round to that northerly course (the "sixteen point turn"). The 5th Battle Squadron on NZ's port quarter are still some distance astern and have yet to start their turn. Wyllie knew all along exactly what he was painting, there was no need to revise the ships' dispositions in the light of subsequent information becoming available! Now removed from it frame and with the surrounds of the drawing (previously hidden) able to be examined closely there are what appear to be "scaling up" lines drawn at intervals both along the bottom and sides of the drawing: further evidence of its intended use as a mock up for a painting, wherever it may now be. Can anyone help please?